I know it's hard to care about anything but Olympic hockey right now, but there is minor league jersey news to catch everyone up on. So let's get started. 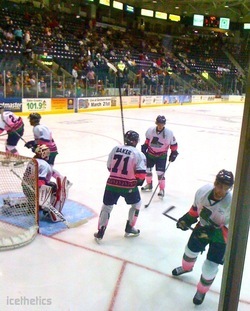 Everblades wearing pinkMy current hometown team, the Florida Everblades held their Pink in the Rink event last night. Shockingly, I couldn't find any decent photos from the team's website to share. So you'll have to settle for the best my iPhone can offer. Shot this (right) during warm-ups before the game. A friend of mine said it looked like the Everblades accidentally washed their jerseys with a red sock. It was her first ECHL game. Also interesting, though I wasn't able to get a picture, the Kalamazoo Wings were wearing blue jerseys with oversized McDonald's logos on them during the pre-game. Any Michiganites out there that can shed a little light on this? Surprising to see a team go with a warm-up jersey like that on the road. For the record, it was a great game. Blades battled to a 4-3 shootout victory. Unfortunately, I was not up on my ECHL rules and didn't realize their shootouts are five rounds, not three. Cheered a little prematurely when Colin Nicholson scored in Round 3 for the 2-1 advantage. Oops. Mudbugs wearing pinkIn the last minor league report, which was exactly a week ago, the Bossier-Shreveport Mudbugs of the Central Hockey League were big news as they had two ridiculous specialty jerseys on deck. They've worn both since then, including this Pink in the Rink night jersey, twice this week. It's probably the worst pink-infused jersey we've seen (and we've seen a lot) but the Mudbugs were able to pull out wins both nights. If you're just dying to see what the back looks like, here's another photo. For the record, if it looks familiar, the Lightning wore that exact numbering and lettering style between 1995 and 2001. Just saying. 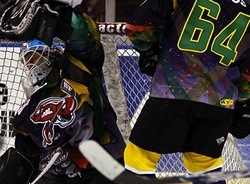 Mudbugs go Mardi Gras!The Mudbugs also wore specially-themed jerseys to ring in Mardi Gras last weekend. Just as terrible as expected. Here they've opted for the Predators' font for the numbers and nameplates. And once again, if you just have to see more angles of this jersey, the Mudbugs are happy to provide photos. As much as we mock them, it is fun to see the ridiculous things minor league teams will wear on the ice in honor of a good cause. By the way, bidding on those Mardi Gras jerseys ended earlier this evening. So sorry, but you can't have one. 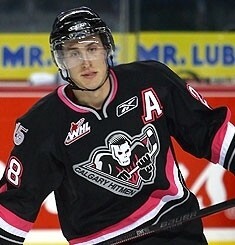 Hitmen wearing pinkSince we can't get enough of pink jerseys, the Calgary Hitmen have us covered. 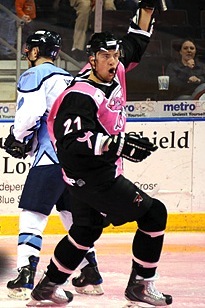 On Sunday, March 7 they'll go pink for Hockey Mums Fight Breast Cancer Night. The cancer awareness promotion began in October and runs through next month. So if you are going to bid, I'd be ready to start high. And for what it's worth, all the information you could possibly ever want about this event, including how to bid on these special sweaters, is just a simple click away. Cyclones celebrate RedsThe ECHL's Cincinnati Cyclones celebrated their Salute to the Reds night back on December 5. 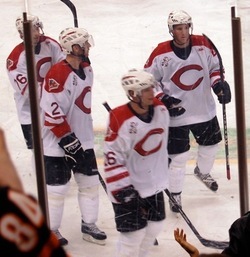 Icethetics reader Andy just sent in a photo (right) of what the jerseys looked like. Imagine if the Cincinnati Reds played hockey. Probably what they'd look like. If you want a better look, there's also this picture of the Mark Voakes modeling the sweater — possibly just before getting his mug shot done. 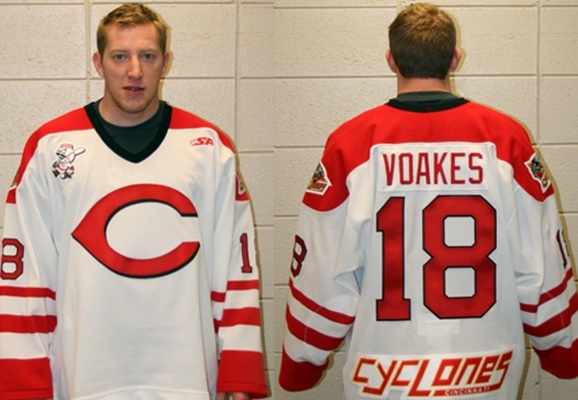 I couldn't find a detailed write-up on the Cyclones' website so I don't really know what the deal was — whether the jersey were auctioned off and what charity benefited — can't say. And finally, Icethetics reader Chip writes in to let us know that the Edmonton Oilers are re-activating their dormant AHL franchise for the 2010-11 season, but this time in Oklahoma City. So that will be another new logo and set of uniforms to look forward to when JerseyWatch 2010 kicks off this summer. Chip says he hopes the yet-to-be-named club will get the Blazers moniker that has existed in some form since the 1960s and, most recently, as a team in the Central Hockey League. Any thoughts on that?